Create all kinds of screensavers. 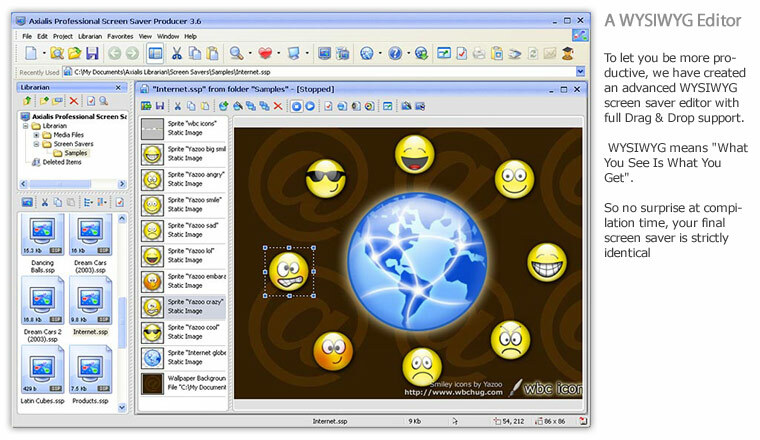 A tool designed to create and distribute all kinds of Windows® screensavers. 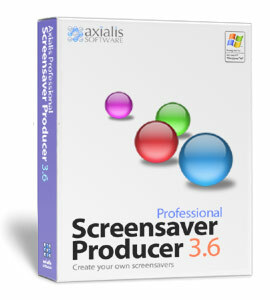 Axialis Professional Screen Saver Producer is a powerful tool to create and compile redistributable Windows® screen savers. 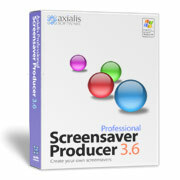 You can create all kind of screen savers based Sprites (animated objects), Flash®, Slideshows and Video Movies. It has a fully integrated workspace that permits you to work efficiently and create professional screen savers in minutes. 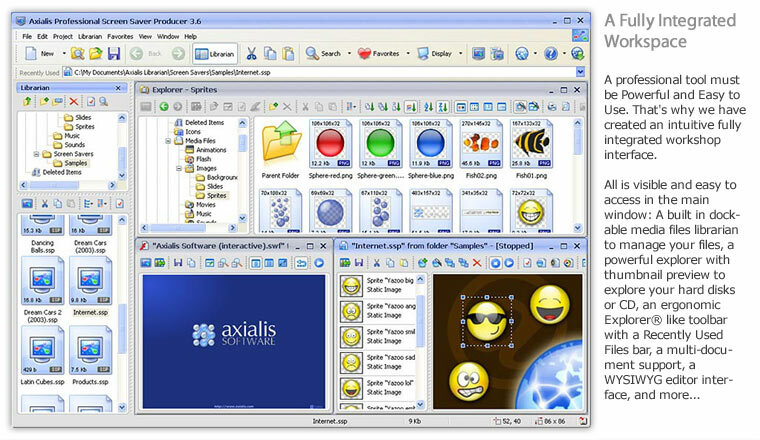 It compiles and produces Windows XP/98/ME/NT4/2000 SCR compatible files with Control Panel preview. You can customize the screensaver About dialog box. 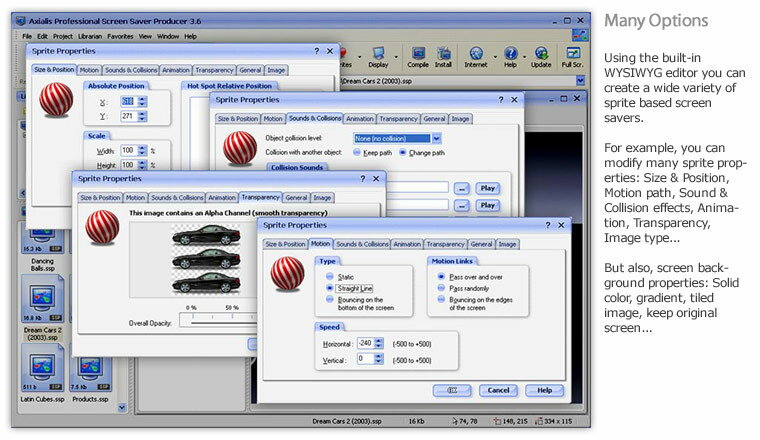 Produced screen savers are compatibles with all video configurations (screen size and color depth). 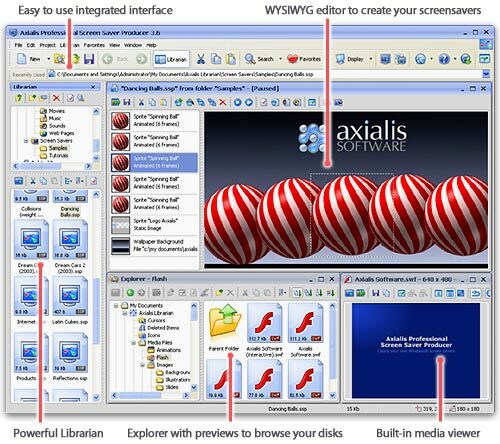 It includes a WYSIWYG editor, an Ergonomic Integrated Suite of Tools, A Built-in Librarian and many other features. 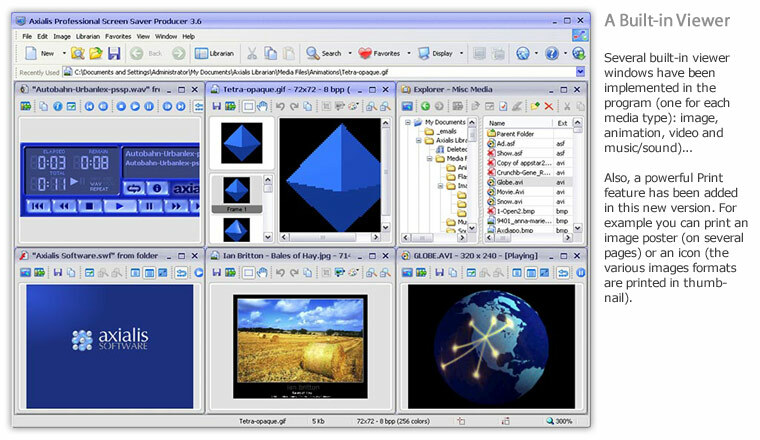 If you use to create Macromedia Flash® movies, you'll produce limitless screensavers. The product is fully compatible with SWF movies up to MX. You can produce full screen or scaled playback. An interesting feature permits to create interactive screensavers (the user can click in movie to interact with the screensaver). Creating slideshow screensavers is also possible: Many transitions are available including the famous "fade-in & fade-out" effects. Several options are available to meet your needs: background sounds, ability to attach a speech to each image, display with automatic screen resolution adjustment, and more. Supported image file formats are: BMP, JPEG, PNG (including with alpha chanel 32BPP), TIFF, PSD, GIF, PCX, LBM, PCD, PICT, QTI, WMF, TGA, IFF and LBM. If you have created a video movie, you'll be able to create a screensaver from it in a few minutes. For example, it's a great idea for a company to make a screensaver from a TV ad clip. 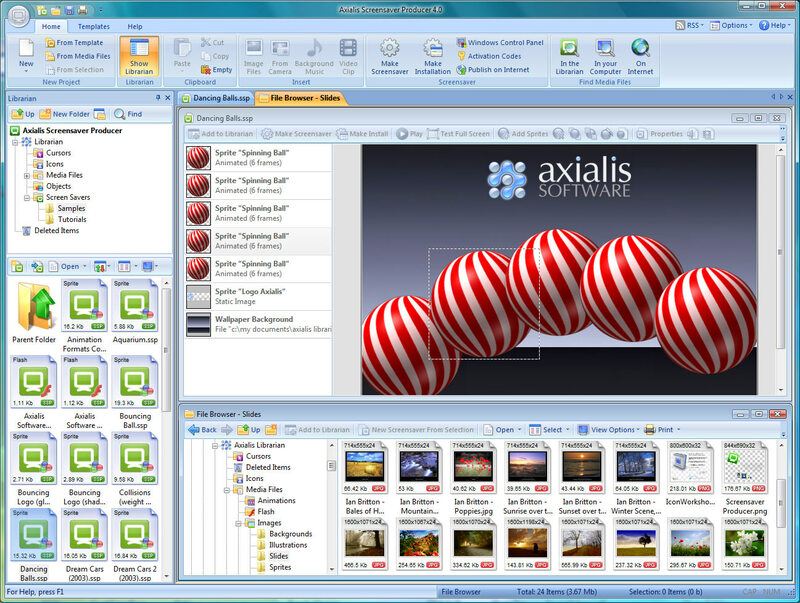 All the video file formats are supported: AVI, MPEG, ASF, QuickTime, RealMedia. 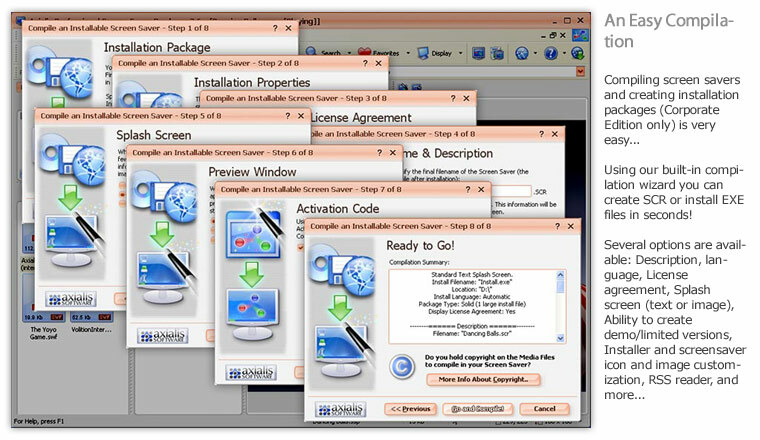 Create professional installation packages: The corporate edition permits to create installable packages of your screensavers. This is the best method to distribute your screensavers. 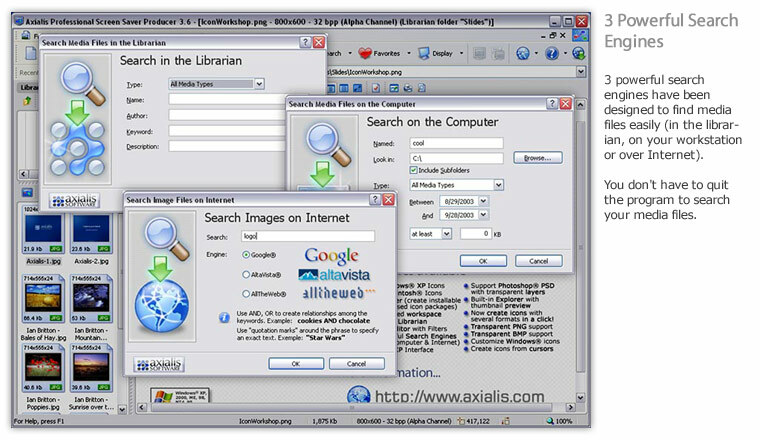 The resulting installation is very professional and permit the end-user to easily install the screensaver. any options are available to customize the installer (logo, icon, license agreement, command switches...). Sell your screensavers by creating Limited/Trial versions: More and more authors actually sell their screensavers. It's very easy using Internet. The product permits you to create demo/limited screensavers. It's very easy because it's just an option of the compilation prosess. You can limit the trial period or the number of objects displayed. The screensaver is unlockable. If the user is interested by the trial version, he purchases a code to unlock it. You can generate unlock codes using a powerful built-in feature. Create multi-language screensavers: The built-in compiler permits you to choose the language of the installation procedure as well as the screensaver dialog. Eight languages are available: English, French, German, Spanish, Dutch, Russian, Portuguese and Italian. Screensaver, Screen Saver, Screensaver Maker, Screensaver Creator, Make Screensaver, Create Screensaver, Compile Screensaver, Sprite Screensaver, Flash, Flash Screensaver, Windows Screensaver, Video Screensaver, MPEG Screensaver, Slideshow, Slideshow Screensaver, RSS Reader. Tryout Messages, Compilation limited to 5 sprites/photos.